It’s not secret that hardwood is a beautiful solution to home flooring. It provides a warm, earthy feel to any establishment. And, it has been a staple in home interior design for hundreds of years. You really can’t go wrong with choosing hardwood flooring for aesthetic reasons. But, maintaining hardwood floors is another story. Since wood is a soft, porous material, it is vulnerable to water damage and scraping. So, if you want to keep your wood flooring looking beautiful throughout the years, you should stop doing these five things. Companies know that hardwood can lose its shine and look dull after a while. So, they try to sell hardwood floor owners with cleaning products which promise to leave floors shiny and new-looking. But, many of the products include wax, which is harmful to your wood floors. Once you’ve used wax to polish wood flooring, the polyurethane coating will be worn. And, you’ll be unable to perform a sanding, buffing, and replacement of the polyurethane coating because the wax will cause the previous coating not to adhere as it should. Instead of using cleaning solutions which include wax or oils, simply mop with water. Or, a generalized wood floor cleaning solution which doesn’t include wax. Yes, shoes can damage the appearance of wood floors. Rubber on shoes can cause scrapes, scuffs, and wear. Plus, the dirt, mud, and water tracked in can wear your flooring even faster. When compared to homeowners who don’t remove their shoes, wood flooring which isn’t constantly marred by shoes lasts up to three years longer! And, requires maintenance like rebuffing and refinishing less often. To get into the habit of removing shoes before entering your home, set up an area in your entryway designated to house shoes. And, invest in some house slippers or comfortable socks! You may even want to consider some for guests who visit! Rolling around on via rolling chairs can damage hardwood. Specifically, it can rip of the protective polyurethane coating and furthermore press dirt within the surfaces of the wood, causing nasty-looking scrapes which can only be reduced by refinishing. If you must use a rolling chair on your wood flooring, consider using an area run or plastic mat to protect the surface of your flooring. Additionally, moving regular chairs around on wood flooring can lead to scrapes and bruising. So, attach felt circles to reduce friction and protect your wood floors. Most people who have hardwood floors don’t think they need to take special consideration when choosing a vacuum cleaner. While you may have carpet in other areas of your home, carpet vacuums are not ideal for maintaining hardwood floors. That’s because many carpet vacuums include brussels and other components which could actually damage the coating of wood flooring. 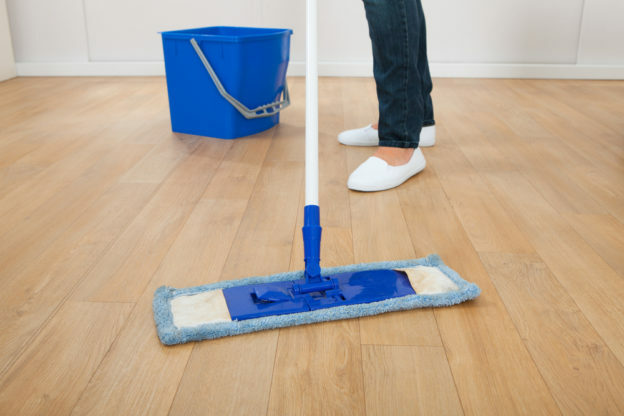 Instead, simply use a soft broom or a vacuum specifically designed for maintaining hardwood floors and cleaning in one! Tired of Maintaining Hardwood Floors? If your hardwood flooring is already damaged and you don’t want to go through with refinishing, it may be time to consider different flooring options. Or, redoing your hardwood flooring. If either of these options are what you’re settled on, you’ll need to demolish your old hardwood floors. Get the help of professionals with Dustbusters Floor Removal Service. Our dust-free system leaves your home clean and ready for install in as little as one day! To get a quote for dustless floor removal, give us a call today at 866-883-8783!